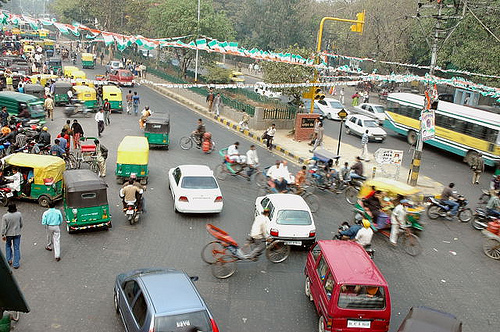 Dangerous Delhi drivers are now under the watchful eye of Facebook's "digital informants." Photo by Mani Babbar. With just 5,000 traffic officers in a city of 12 million people, Delhi Traffic Police are enlisting the help of Facebook to crack down on traffic violations, as reported in The New York Times today. The DTP created a Facebook page a couple of months ago to help manage traffic safety and congestion — especially important for Delhi, which is gearing up for the Commonwealth Games. India is known for its fatal road conditions and needs all the help it can get to improve the situation. “Delhi Traffic Police cannot possibly succeed without the active cooperation, participation and support of all the citizens,” says the DTP’s Facebook page tagline. With more than 17,800 fans and close to 3,000 photographs (plus nearly 50 videos), the Facebook page is an example of how online tools can be used to help improve transportation in cities around the world. By examining license plate numbers from user-submitted photographs, the DTP have issued 665 tickets, according to the city’s joint commissioner of traffic, Satyendra Garg. Groups like The Urban Vision, a Mumbai-based think-tank, go a step further by encouraging residents from cities across India to report issues on interactive maps (created by SeeClickFix), embedded on a customized “Citizen Watch” website. Of course, there are some concerns with this new “crowd-sourced” model of traffic policing. Finally (and ironically), what if all this cell phone picture-snapping distracts people from the road, creating even more traffic accidents? Using Facebook to bolster law enforcement, especially for traffic violations, is nothing new. In India, the Chennai Traffic Police already have a Facebook page. Traffic officials in Hyderabad are now considering the idea. And it looks like Ahmedabad has jumped on the bandwagon, too. There are other examples from other countries: Cities from Jakarta to Toronto are turning to the largest social networking site on the planet to help make streets safer locally. As the rampant activity on DTP’s Facebook page shows, the possibilities for public engagement through online media are endless.